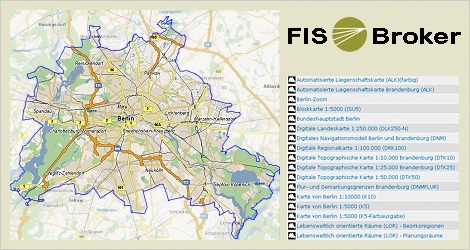 The FIS Broker provides online access to maps, plans and other data of the Senate Department for Urban Development and Housing. Spatial selection via address search or with regard to contents via keywords is possible. A viewer shows maps and factual data. Please note that this material is not legally certified information. For such information, please see the official maps . For this purpose, please consult the persons listed under "Contact" , for the respective topics.